N64 The Legend of Zelda: Ocarina of Time (USA v1.0) in 56:54.2 by Bloobiebla. In the revolutionary 3D debut for The Legend of Zelda series, Link must travel around the colorful land of Hyrule and awaken six Sages in order to save it from the evil Ganondorf. This movie uses a variety of sequence breaks and shortcuts to complete the game in under an hour using a minimal number of inventory and quest items. 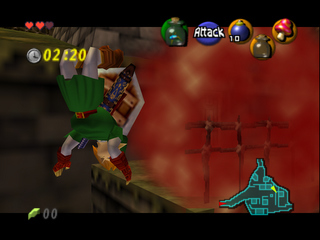 Of central interest are the ability to glitch through the Door of Time, meaning that no dungeons need to be entered as young Link, and a memory manipulation glitch known as the Reverse Bottle Adventure, allowing the medallions collected from adult Link's dungeons to be pulled out of thin air; therefore the only dungeon that is ever entered in this run is Ganon's Castle. While this run seems to be only 1:31.26 faster than the predecessor movie, the saving is a bit over 8 minutes. This is due to the fact that the Japanese ROM image used for the previous run had a faster text speed, shortening the cut-scenes by 6.5 minutes. If you know the cutscenes of this game by memory at this point and would rather watch an encode without them, it's your lucky day!